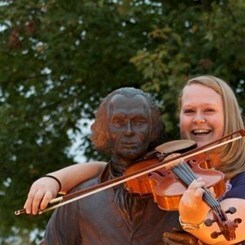 A graduate of James Madison University, Jill Wisinski studied music education. Taking her passion for strings further, she now teaches in the Fairfax County Public School system in addition to Music and Arts. Jill is fantastic at taking what students are interested in and applying the necessary technique and theory necessary to get that piece you are playing juuuust right! If you are looking for a lesson full of laughs and learning, Jill is your teacher! Request Lessons with Jillian Wisinski today!